Gift Boxed Wenger Men's 43mm Gold-tone Bracelet Quartz Watch. It features a stainless steel bracelet with push button fold over safety clasp and features a cream dial protected by a sapphire crystal glass. Quality watch made by Victorinox. Swiss (battery). Sapphire crystal Glass. SWISS MADE. SAPPHIRE COATED GLASS. CASE SIZE WIDTH, 42.5 mm, APPROXIMATE (WITHOUT CROWN). Quality watch made by Victorinox. Case depth approx 42 mm. Sapphire crystal Glass. PRODUCT DETAILS Large adjustable strap will fit a wrist size up to 210 mm. It features a stainless steel strap 20 mm width with a fold over push button clasp with safety catch and Swiss logo, it also features a black satin dial protected by a sapphire crystal scratch resistant glass. It features a stainless steel and gold plated strap 20 mm width with a fold over push button clasp with safety catch and Swiss logo, it also features a black satin dial protected by a sapphire crystal scratch resistant glass. It features a stainless steel bracelet with push button fold over safety clasp with safety catch and features a stunning black satin dial protected by a sapphire crystal scratch resistant glass. A Stunning top Quality Swiss watch made by Victorinox Switzerland. This watch has a fixed bezel and a textured push/pull main crown. 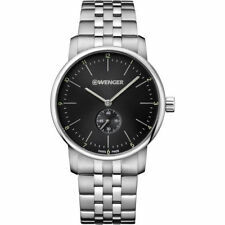 Wenger 01.1541.102 is equipped with a silver stainless steel bracelet. Securing the bracelet is a fold over push button safety lock clasp made in stainless steel. It features a stainless steel bracelet with push button fold over safety clasp with safety catch and features a stunning blue dial protected by a sapphire crystal scratch resistant glass. A Stunning top Quality Swiss watch made by Victorinox Switzerland. Model: 78239. WENGER - Makers of the original Swiss Army Knife Case/ Dial : Brushed and Polished Stainless Steel. Style: GST. Dial: Silver Textured. Bracelet : Brushed and Polished Stainless Steel. Case is made out of Stainless Steel while the dial colour is Black. The features of the watch include (among others) a date function. It can be worn while washing your hands and will be fine in rain. All original Wenger manuals, Presentation Box & Certificate of Authenticity. This watch features Green Nylon Strap with pin buckle (Interchangeable Black Nylon Strap included). Date window between 4 & 5 o'clock. Display Type ﻿ Chronograph. Dial Window Material Type ﻿ Sapphire. Case MaterialStainless Steel. Case sizeLarge. Band MaterialStainless Steel. Item ShapeRound. All original Wenger manuals, Presentation Box & Certificate of Authenticity Model #: 01.1041.125. Date window between 4 & 5 o'clock. Stainless Steel bracelet. Swiss Made. - Stainless Steel Case and Bracelet. - Case Width (without crown): 42mm (approximate). Display Analog. Model Avenue. - Black Dial. Band Type Two-Piece Strap. Band Material Stainless Steel. Swiss Made. Model Attitude Chrono. - Black Stainless Steel Case and Bracelet. Display Analog. - Black Dial. Band Type Bracelet/Link Band. Band Material Stainless Steel. Watch Shape Round. Swiss Made. - Black Stainless Steel Case and Bracelet. Model Urban. Display Analog. - Black Dial. Band Type Bracelet/Link Band. Band Material Stainless Steel. Watch Shape Round. Model Wenger 70186. Features 12-Hour Dial. Features 24-Hour Dial. Age Group Adult & Teen. Watch Shape Round. Face Color White. Case Color Gold & Silver. Style Sport. Chronograph Functions. - Swiss Made. Chronograph Type Chronograph. - Stainless Steel Case and Bracelet. - Case Width (without crown): 44mm (approximate). Model Attitude. Band Type Bracelet/Link Band. Swiss Made. - Stainless Steel Case and Bracelet. Model Avenue. Display Analog. - Black Dial. Band Type Bracelet/Link Band. Band Material Stainless Steel. Band Color Silver. Modell Wenger Battalion III. Model: 72328 Battalion III. Functions: Calendar, hour, minute, second. Band Material: Stainless Steel. Crown: Screw down. Crystal: Sapphire Coated Crystal. Calendar: At 4 o'clock. MPN 72808W. Wenger's man watches. Stainless steel case silver and silver plated stainless steel belt. Blue sphere. Folding closure. 100 m water resistance. Género Hombre. WENGER by VICTORINOX SWISS ARMY. WATCH MADE Sphere black with bracelet steel. Swiss made, saphir crystal & 100M (10 ATM) water resistant. Black sphere. 3 years Warranty. Made by Victorinox Swiss Army SA. WENGER by VICTORINOX SWISS ARMY. WATCH Swiss MADE 200M Water resistant. Swiss made, saphir crystal & 200M (20 ATM) water resistant. Blue sphere. 3 years warranty. Made by Victorinox Swiss Army SA. Swiss Made. - Stainless Steel Case and Bracelet. - Grey Dial. Model Urban Classic. Display Analog. Band Type Bracelet/Link Band. Band Material Stainless Steel. Band Color Silver. Swiss Made. - Sapphire Coated Crystal. - Stainless Steel Case and Bracelet. Model Urban Classic. Display Analog. - Blue Dial. Band Type Bracelet/Link Band. Band Material Stainless Steel. Rectangle case. Watch Shape Rectangle. White Dial. Features 12-Hour Dial. 18K gold plating on stainless steel case. Features 24-Hour Dial. Band Material Stainless Steel. Case Material Stainless Steel. Model Wenger 1014.10. Crown: Regular. Band Material Stainless Steel. Case Material: Stainless steel. Stainless steel Lug Width: 22mm. Band Color Silver. Case Material Stainless Steel. Lug Width 22. Swiss made, case and bracelet made of stainless steel 316L, gold PVD coated bezel with decorative screws, screwed Caseback, mineral crystal, water resistant to 10 bar, diameter 43 mm, height 11 mm, gold PVD coated stainless steel strip, folding clasp, safety trigger, 3-hand Swiss quartz movement Ronda 515, date display, Sunray dial, applied indexes, Luminescent Hands and markers. WENGER by VICTORINOX SWISS ARMY. WATCH Swiss MADE. Strap milanese. Made by Victorinox Swiss Army SA. Swiss made, saphir crystal. 3 years warranty. MPN No aplicable. EAN No aplicable. Wenger's man watches. Stainless steel case silver and silver plated stainless steel belt. Black sphere. Closing double folded. 100 m water resistance. Género Hombre. Correa Acero inoxidable. Two Year Limited Warranty. Model: 70787. Model 70787. Style: Battalion Chrono Sport. Crystal: Sapphire Coated. Dial: Black with Blue & Silver Accents. Case: Brushed & Polished Stainless Steel. Strap: Brushed & Polished Stainless Steel. Modell Wenger Squadron GMT 77076. Model: 77076. Functions: GMT, calendar, hour, minute, second. Misc Information: GMT. Clasp Type: Tang. Clasp Material: Stainless steel. Band Material: Stainless steel, silicone and genuine leather. Wenger's man watches. Stainless steel case silver and silver plated stainless steel belt. Blue sphere. Folding closure. 100 m water resistance. Género Hombre. Correa Acero inoxidable. WENGER by VICTORINOX SWISS ARMY. WATCH Swiss MADE Sphere blue and strap steel. Swiss made, saphir crystal, chronograph & 100M (10 ATM) water resistant. Blue sphere. 3 years Warranty. Made by Victorinox Swiss Army SA. 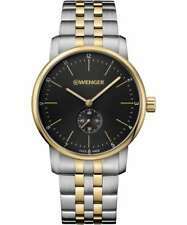 Wenger Analogue Quartz 01.0441.138. WENGER Sport Dynamic Field. Display Type﻿: Analogue. Clasp Type﻿: Fold over clasp. 10 ATM;Date;Stainless Steel 316L;Sapphire Coated Crystal;. Band Material: Stainless Steel. Dial Window Material Type﻿ Mineral. Dial Colour black. Case Material Stainless steel. Watch Information. Band Material Stainless steel. Bezel Material Stainless steel. Band Colour silver. Display Type﻿: Analogue. Display type : analogue. Clasp Type﻿: Fold over clasp. Band Material: Stainless Steel. Case Material: Stainless Steel. Band material : stainless steel. Band Colour: Silver. Case material : stainless steel. Dial Window Material Type : Mineral. Attitude Outdoor Quartz Watch silver. We will do our best to turn any less than satisfactory experience into a positive one. Band Length : standard length. Model Year : 2017. 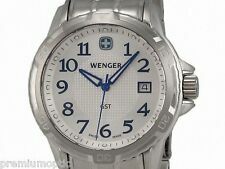 Wenger Sport dynamic; Swiss made; 3 Years Warrenty; 10 ATM; date; 316L Stainless Steel, Sapphire coted glass; Blue Dail. Dial Window Material Type : Mineral. We will do our best to turn any less than satisfactory experience into a positive one. It is fastened with a black leather strap and has a cream dial. The watch has a date function. Dial Window Material Type : Mineral. We will do our best to turn any less than satisfactory experience into a positive one. 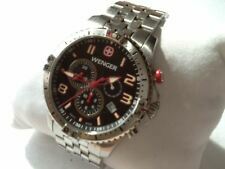 Make a statement when you wear one of these handsome wenger stainless steel band men's watches. Bolder than other designs, these men's watches typically have bigger faces. They are built with scratch-resistant straps for added durability. The bands have a modern style, which gives them a beautiful, sleek feel. With traditional styles, gold-plated case watches are versatile accessories for a night with friends. The gold-plated designs are often tarnish-resistant, keeping them in pristine condition for many seasons to come. Silicone case watches are ideal for people with more sensitive skin. With flexible materials, these silicone watches are perfect for anyone who has an on-the-go lifestyle. Binary wristwatches display the time in a bar graph with ones and zeros. They are typically built with backlighting, so you can easily read the time in poor lighting conditions. LED wristwatches show the time in bright digits, so they are incredibly easy to read. Typically built with a quartz crystal and a tiny digital computer in order to keep track of the time, they are extremely accurate. Mechanical movement wristwatches showcase the perfect combination of traditional design and ease of use. They are very low-maintenance for added convenience. Quartz movement wristwatches are classic timepieces that are easy to maintain. The movements are known for their accuracy and precision, making these watches exceptionally reliable.